This year FairMail is celebrating its tenth anniversary. 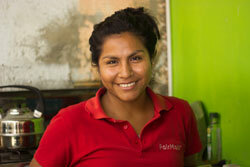 We got the biggest gift of all from former FairMail Peru photographer Maria flor who became the first FairMail teenager to get a university degree! And also the first in her family. In July she defended her thesis successfully and finished the 5-year communications sciences degree at the UCV private university. In many of the following semesters Maria flor repeated this performance and received more scholarships for her high scores. Even with a university degree finding a good job is not easy in Peru. A lot depends on who you know amongst potential employers so they can recommend you. Moreover, most employers are looking for employees with experience. And usually the first years you have to deal with being lowest in the hierarchy so your next job can be better. To increase your chances to find a job it is also very important to have various degrees. So it looks like Maria flor isn’t finished studying yet. She wants to complement her degree with studying English, graphic design and audio visual techniques. And she wants to work as Au Pair in the USA for one year. That’s Maria flor, always working on new goals. 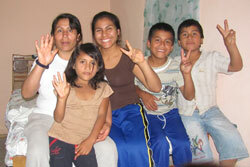 With Maria flor out of university we currently have two Peruvian teenagers in University: Yuli and Anidela. Actually three as Juan Gabriel just started studying communication sciences at the UPAO private university in August. On his way to become FairMail’s first male university graduate?